In Lewington v The Motor Insurance Bureau  EWHC 2848 (Comm) Mr Justice Bryan considered whether a stolen dumper truck being driven on a public road was covered by the MIB agreement. There was a clear, and unequivocal finding that it was. 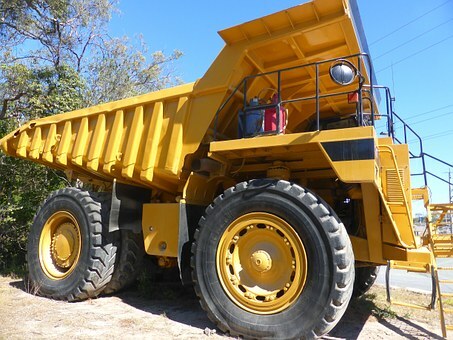 The claimant suffered serious injury when she was struck by a stolen dumper truck. The truck was being driven on a public road. The criminal ran off and was never traced. The arbitrator appointed under the MIB agreement found that the accident was the fault of dumper truck driver. However the arbitrator went on to find that the MIB was not required to pay because, it was held that the dumper truck was not a motor vehicle and did not require motor insurance. These were summarised by the judge. The questions of law that arise concern the proper interpretation of section 185(1)(c) of the Road Traffic Act 1988, which it is common ground is to be interpreted in accordance with the principles identified in the Marleasing case (case C-106/89) and, therefore, the wording and purpose of the relevant EC Directive. Since 1972 EC Directives have required Member States to impose compulsory insurance upon motor vehicles on land. The original EC Directive was 72/166/EC. With later Directives it was consolidated into EC Directive 2009/103/ EC, which is the relevant Directive in the present case (the “Directive”). There is a difference between the Road Traffic Act 1988, section 185(1)(c) and Article 1.1 of the Directive 2in relation to which “motor vehicles” are required to be insured for use on roads. The former provides that “motor vehicle” means “a mechanically propelled vehicle intended or adapted for use on roads” (my emphasis) whilst the latter provides that “vehicle” means any “motor vehicle intended for travel on land and propelled by mechanical power” (my emphasis). It is the Appellant’s case that the Road Traffic Act has to be interpreted by the Arbitrator in accordance with the purpose of the Directive which was to provide protection for members of the public from the negligence of others who were driving vehicles with engines on public roads, but that the Arbitrator failed so to do as a result of erring in law as to the correct test under section 185(1)(c) interpreted in accordance with Marleasing principles. The judge carried out a detailed review of the Directive. (3) Each Member State must take all appropriate measures to ensure that civil liability in respect of the use of vehicles normally based in its territory is covered by insurance. Paragraph 8, provides that the national law of each Member State should provide for the compulsory insurance of vehicles against civil liability, such insurance to be valid throughout Community territory. Paragraph 10 provides for the possibility of derogation in certain circumstances, for example, by bodies like the Ministry of Defence. Paragraph 11 provides for derogation for specific types of vehicles carrying special plates. Paragraph 12 provides for minimum amounts of insurance. Paragraph 14 provides for the setting up of bodies such as the MIB to guarantee that the victim will not remain without compensation where the vehicle that caused the accident is uninsured or unidentified, and that it is important to provide that the victim of such an accident should be able to apply directly to that body as a first point of contact. Paragraph 15 provides in relation to exclusion clauses and what derogation arises in relation to stolen vehicles or where there has been violence used in the taking of the vehicle. Paragraph 16 provides for derogation in terms of excesses. Importantly, at paragraph 20 it is provided that, “motor vehicle accident victims should be guaranteed comparable treatment irrespective of where in the Community accidents occur”. There is then at paragraph 23 a provision in relation to no derogation in relation to alcohol. It is clear from the preambles to the Directive that there cannot be any blanket derogation based on geography, intent or type of vehicle. Therefore, subject only to the specified derogations, Member States cannot create their own derogations see the case of Delaney v Sec of State  EWHC 1785 at paragraph  onwards and paragraphs  to . “2. The victim may in any event apply directly to the body which, on the basis of information provided at its request by the victim, shall be obliged to give him a reasoned reply regarding the payment of any compensation. On that final point the Appellant says that the Arbitrator comes very close, in fact, to reaching a conclusion which would be contrary to that provision. In a large number of cases where there has been an attempt by the insurance industry to derogate from the blanket obligation to insure motorised vehicles such an attempt, and associated interpretation of the Directive, has been rejected as contrary to EC law. There are a number of cases in this area which I have been referred to. For example, in the relation to the alcohol derogation being rejected two cases, Ruiz Bernáldez which is case number C129/94, in particular see paragraphs 18 and 19 and Candolin and Others  ECR I-5745, in particular at paragraphs 17, 18, 21 and 22. (The Appellant would say equally to be accorded to members of the public). Equally extension of the guilty knowledge derogation has been rejected in the Delaney case  EWHC 1785 QB and the case of White v White  UK HL 9. That case is another example of something being used on the road and requiring insurance even though it could not be ridden lawfully on the road. “56. In the light of all those factors, and in particular of the objective of protection pursued by the First to Third Directives, the view cannot be taken that European Union legislature wished to exclude from the protection granted by those directives injured parties to an accident caused by a vehicle in the course of its use, if that use is consistent with a normal function of that vehicle. 57. In that regard, it is also important to point out that, according to part A of the Annex to Directive 73/239, as amended by Directive 84/641, the class of direct insurance activity relating to ‘Motor vehicle liability’ concerns ‘[a]ll liability arising out of the use of motor vehicles operating on the land’ (including the carrier’s liability). 58. In the present case, it must be pointed out that first, as is apparent from information published by the Commission, the Republic of Slovenia did not, pursuant to Article 4(b) of the First Directive, exclude any type of vehicle from the scope of Article 3(1) of the First Directive. Secondly, according to the information provided by the referring court, the accident which gave rise to the dispute in the main proceedings was caused by a vehicle reversing, for the purpose of taking up a position in a specific location, and therefore seems to have been caused by the use of a vehicle that was consistent with its normal function, this, however, being a matter for the referring court to determine. On the facts of that case a tractor was manoeuvring in the courtyard of a farm and someone was knocked off a ladder by the tractor. It is hardly surprising that this was considered to be a use that was consistent with a normal function of that vehicle. However, it is said on behalf of the MIB in the present case, that the use of the dumper truck was not consistent with the normal function of the vehicle, and that where the court is using those words in paragraph 56 (as quoted above) such words would not apply to the vehicle under consideration. I consider that in the case of VNUK, where the court is talking about uses which are consistent with the normal function of that vehicle, what they are actually seeking to do is distinguish matters which relate to the normal use of a vehicle, such as moving from A to B or whatever, and the vehicle being used in a way where it is not being used as a vehicle as such. The example given by Mr. Ritchie QC for the Appellant, is that of a situation whereby someone has climbed on to a tractor with a view to picking some apples from an apple tree under which the tractor has previously been parked, and therefore effectively using the vehicle, not as a vehicle, but as a ladder, and in the course of doing so a bucket that the person is holding falls and injuries somebody. He says that this situation, where the use to which the vehicle is being put is not a use of a vehicle that is consistent with the normal function of that vehicle, is what the European court were concerned with. I agree. The MIB submits that an essential feature of the definition of motor vehicles in section 185 of the RTA is that it is confined to vehicles intended or adapted for use on roads. It is said that it is not possible to apply Marleasing principles to make that definition compatible with a definition of motor vehicle in the Directive because that definition contemplates use anywhere. In order to make it compatible (says the MIB), it would be necessary to substitute the word “roads” with “land” and to do that would be to go against the grain of the legislation and to involve amendment rather than interpretation, neither of which is permissible. This was, of course, the Arbitrator’s conclusion which is the subject of the first ground of appeal. Addressing this ground of appeal, I fundamentally disagree with the proposition that it is not possible to apply Marleasing principles to make the definition in section 185 compatible with that of the Directive. It is true that there may be other circumstances where it is possible to contemplate that there may be a difference (and potentially an inconsistency) in the context of an off-road scenario, but that is not this case, and is not a matter for determination today. Nor does any such difference impact upon the conclusions I have reached. It does not go against the grain at all nor is it contrary to the underlying thrust of the legislation applying the principles that I have identified, including those in Vodafone and Churchill to have regard to the purpose of the RTA when construing section 185 of the RTA and to have regards to the common purpose in the Directive. In the first instance that simply involves applying the common law principles identified by Lord Parker in Burns v Currell. It is quite clear, as I have already identified, that the relevant test is, and has always been understood to be, that set out in Burns v Currell namely to look at whether “a reasonable person looking at the vehicle would say that one of its users would be a road user” – is “some general use on the roads contemplated as one of the users”. In this regard it is quite clear that the purpose of section 185 of the RTA is to provide protection against uninsured drivers in circumstances where one of the users of the item of equipment concerned is use on a road. That is the common law test as has been repeatedly applied in subsequent cases such as the ones that I have already identified. It is also equally clear from Winter v DPP any qualification in relation to that is narrowly construed, given that any carving out would derogate from the purpose of the statutory provision. The Arbitrator erred in law in saying and finding, as he did, that it is not possible to reconcile the wording of section 185 with the Directive. It is perfectly possible to do so if one has regard to the common purpose of the Road Traffic Act 1988 and the Directive, namely to ensure that if vehicles are used on roads, there is insurance in place, and if there is not, there is redress through the relevant body, here the MIB, for anyone who suffers loss or injury in consequence. This has long been understood to be the purpose of the Road Traffic Act 1988, and it is clear from the preambles and Articles of the Directives that I have quoted, that that is also the purpose of the Directive. I consider that the Arbitrator took his eye off the ball in this case by focusing upon an issue which was not before him which was the outstanding question of whether or not section 185 is compatible with the Article in an off-road scenario. Here we are concerned with an on-road scenario. It seems to me that he erred in law in finding that the two were irreconcilable. That is the first error of law that he committed. I also consider that he erred in law in his application of the principle in Burns v Currell because (although he cited the judgment of Lord Parker in Burns v Currell and the subsequent cases that followed thereafter), he failed to focus upon the opening words of what was said by Parker LJ at page 300E, namely where he stated “I prefer to make the test where a reasonable person looking at the vehicle would say that one of its users would be a road user” and his conclusion that the real question is, “is some general use on the roads contemplated as one of the users.” That is the established test at common law, and it can be applied in the same manner both at common law and applying Marleasing principles in the context of the Directive. The words, “in deciding that question, the reasonable man would not, as I conceive, have to envisage what some man losing his senses would do with a vehicle; nor an isolated user or a user in an emergency”, do not appear in section 185 and have long been regarded as a “narrow qualification” (see DPP v King). What is being interpreted are the words of the statute itself. When interpreting those words it will, in most cases, not be necessary to go beyond asking whether a reasonable person looking at the vehicle would say that one of its users would be road user. However, a question arises as to whether there can ever be a situation where there is an isolated user or user in an emergency which is to be carved out so that the vehicle would not be a motor vehicle within section 185 applying Marleasing principles in the context of the Directive. I do not consider that it would be appropriate for me to determine that as a matter of law in the context of this application because it is not necessary for me to do so, and it is possible that there may be factual scenarios which may arise in the future where there may still be some scope for such a carve-out, for example in an emergency type scenario. However, my view is that the writing is on the wall, having regard to cases such as Chief Constable of North Yorkshire v Saddington and DPP v King from which it is clear that any qualification is to be narrowly construed, and the facts of those cases are good illustrations of that because those are cases where the manufacturer effectively forbade them to be used on the road, and it was not lawful for them to used on the road, yet they were found to be motor vehicles. Applying a purposive approach to statutory interpretation, and applying Marleasing principles in the context of the Directive, there may well be another case, and it is not this case, where it is necessary to determine whether in fact that gloss, as I have put it, or qualification, can in fact survive the modern approach to purposive interpretation and the application of Marleasing principles in the context of the Directive, but that is for another day and another case. In the present case the second error of law which was committed by the Arbitrator was that he failed to apply the test at common law set against the backdrop of the purpose of section 185 of the RTA. The third error of law of the Arbitrator was that, although he identified the appropriateness of having regard to the purpose of the statute (see paragraph 66 of the Award), he failed to do so, and have regard to the purpose of the provision in the context of both the Road Traffic Act and the Directive. The reason why he did not do so is reasonably clear, and is the result of his first error of law in regarding the statute and the Directive as incompatible. The Arbitrator unduly focussed upon the difference between “road” and “land” and a scenario which could arise in another case, but did not arise in the present case. What he should have done was focus on the purpose of the statutory provision, which is a perfectly proper approach to interpretation, and if one applies a purposive approach to the interpretation of the statute, it would be consistent with that purpose to find that a scenario where someone steals a vehicle, where a reasonable person looking at the vehicle would say that one of its users would be road user, would be covered by the provisions of the RTA, including the MIB provisions that we are concerned with. Such a conclusion would have been fortified, if section 185 was construed applying Marleasing principles and regard had to the purpose of the Directive that I have already identified. It is very much in accordance with the purpose, both at common law, under the statute, and also applying Marleasing principles under the Directive, that there would be cover in a scenario such as the present. “77. Would the reasonable person have contemplated a subsidiary but still general use (as opposed to an isolated or irregular use) of the earth mover on a road. 78. In my view the answer to that question is no. It is clear that what the Arbitrator says at paragraph 79 of the Award colours what he says at paragraphs 77 and 78, and those paragraphs themselves have to be read subject to what I have said about his other error of law. I disagree with what the Arbitrator says at paragraph 79, and consider that he erred in law when he said that a reasonable person would not have contemplated the use of the earth mover on a road unless that use had been lawful. It is quite clear from a number of cases that it is possible, and it can be contemplated by a reasonable person, that an item, be it an earth mover or whatever, can be used on a road in circumstances where its use on a road is unlawful. Cases such as Chief Constable of North Yorkshire Police v Saddington and DPP v King are illustrations in point. I consider that when contemplating the use of an earth mover on roads, a reasonable person would contemplate what thieves and criminals might do and might use the item to do, such as take it from a quarry and drive it, as part of a theft, on public roads. I consider that such a conclusion is entirely consonant with the purpose both of the statute and with the purpose of the Directive and that in reaching a contrary conclusion, which appears to have coloured the findings that he made, when the Arbitrator applied the facts to the law, that is an additional respect in which he has erred in law. I accordingly find that the Arbitrator erred in law in the respects I have identified. That leaves the question as to whether to remit the matter in question for reconsideration by the Arbitrator based on the correct legal test that I have identified and applying the facts thereto. I am satisfied that it would be inappropriate for me to do so in circumstances where the Arbitrator has made comprehensive factual findings in the present case which if one now applies them to the correct legal test, which I have identified, leads to but one conclusion and that conclusion is that this dumper truck was indeed a motor vehicle within the meaning of section 185 of the RTA applying the common law authorities and Marleasing principles. If one overlays the actual factual findings of the Arbitrator, in particular those I have identified above, to the correct legal principles that I have identified, as set out in Burns v Currell applying a purposive approach to interpretation of the statute and applying Marleasing principles in the context of the Directive, then there is only one conclusion which can be reached and that is that this dumper truck was a motor vehicle within section 185 of the RTA. It is accepted by the MIB that if, as I have found, the dumper truck is a motor vehicle within section 185, then since it being used on the road at the time of the accident, that is a use which was required to be insured under section 145 of the RTA. On that basis the MIB does not seek uphold the Arbitrator on that issue. Accordingly, for the reasons I have given, I find that the Arbitrator erred in law in the respects that I have identified and that applying the factual facts found by the Arbitrator the dumper truck was a motor vehicle within section 185 of the RTA, and therefore required to be insured. In the above circumstances I set aside the Award in whole under section 69(7)(d) of the Arbitration Act 1996, and declare that the dumper truck was a motor vehicle within section 185 of the RTA, and therefore required to be insured, and in consequence the MIB was under a liability to the Appellant.